Wish Happy New YEar Smita... the pictures and ur work is awesome. Thanks for checking out my blog. I look forward to reading more of yours. Happy New Year! WISH YOU AND YOUR FAMILY A VERY HAPPY NEW YEAR. You have a nice blog and so creative you are every thing looks so beautiful.And thank u so much for visiting my blog. Oh, this looks so good. And yummy!! Happy New Year, Smita!! Wishing you many blessings and many more wonderful food posts in the new year. Happy New year to you too. Love your blog. it is so much fun! Great little treat that I'm sure pleases the young ones and adults! Happy New Year to ya! Thanks for stopping by kothiyavunu and for kind words..Awesome Work! !Wish u Happy New Year!! Hi, Thank you for your kind words. Love the tempting 'sweet' presentation! Happy new year! Wishing you and family a Bright, Prosperous and Happy New year dear. Thanks for stopping by my blog and commenting! You have beautiful and yummy food "art" on your blog! How fun and fancy! :) Have a Happy New Year! Thanks for stopping by my blog and for the wishes.I really love ur art and very much impressed.Nice recipe children love it.Happy New Year. happy 2011! wishing you peace and happiness. very happy new year to u.
Hi smitha thanks for visiting my space...you have a lovely space...keep visiting and Happy New Year!!! Absolutely lovely! I can tell I'm going to love your blog ... so creative!!! BRILLIANT! I look forward to looking around and getting to know you! Happy New Years Day! Hi Smita! Thank you for visiting my blog (http://barefootinportland.blogspot.com). I love your blog and I am now following. It has great ideas that may just get my picky little eater to actaully eat!! Happy new year to you and your family. Can't wait to read more from you. The pics look so beautiful. Wishing u and family a very happy and prosperous 2011. Happy New Year! Your food creations are so fun and cute! I cannot wait to see all the fun stuff from you in 2011! Thanks a lot Smita for visiting my blog..Happy New Year to you and your family !! thx alot for visitng my blog n sweet comments..u have wonderful space here ..enjoy staying here..glad to be ur next followe! Love those chocolate numbers! Happy New Year! WIshing u a happy and prosperous new year..sooo cute..
Hi Smita-Your chocolate numbers and other cute creations are so beautiful. Also, thank you for your kind comment on my blog. It's a pleasure to meet you! Wishing you a New Year, that is filled with health, prosperity, and happiness! Happy New year to you too .... Gr8 recipe ... Loved going thru your blog ... following you .. So very nice to visit your blog Smita! I often see your photos on Kanak's blog. What wonderful treats you have shared today. I look forward to visiting you in this new year. All the best to you and your family. Those pictures look so delicious. Thank you for visiting Gourmet Meals For Less. Wish you a very happy new year !!! Amazing clicks!! Thanks for your compliment on my blog and gald you enjoyed it. I see that a lot of my friends are your friends too. 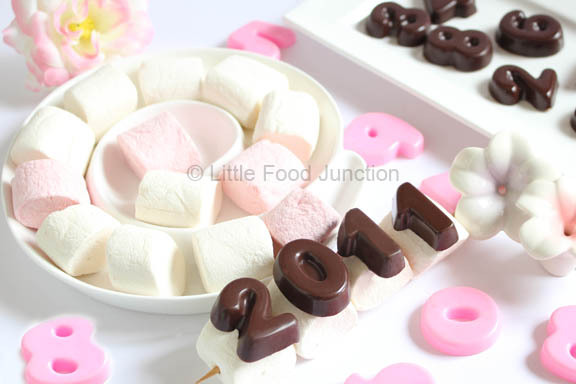 Love the 2011 Choco- Marshmallow pops. Hello! I have just had the best time perusing many of your posts! Each photo is just adorable and so creative yet simple to make. I am sitting here smiling just knowing how much fun these food would be to children. I have 9 grandchildren, all but one age seven and under. They would love the presentation of foods you show. I am so happy you stopped by my place and left your comment so I could come by to meet you! Wow- I love ur creativity with food. Wishing you a Wonderful Year ! Thank you very much for your visit and comments! Happy New Year to you and your family! Thank you for stopping by and leaving a comment. A Happy New Year to you and your family! That looks so pretty...Happy New year !! Happy New Year! What a beautiful blog you have you have so much talent. I enjoyed looking around! Wishing you a happy 2011! Looking forward to more of your creativity. Thank you for stopping by in my blog!I am your new follower.C's birthday is very soon I need to get some rainbow food ideas for her party. Thanks for sahring!